Anyone who knows me personally will tell you that I am an educator who absolutely loves to sing and dance. I believe in the power of music because it can do so many things all at once. It can educate and entertain our students’ minds, it can trigger positive feelings in their hearts, it can help them relax after a stressful class, and so much more. That is exactly why I often try to incorporate music into my speech therapy sessions whenever possible. Silly songs for silly students! If you ever get the chance to walk past my speech therapy room, you will undoubtedly hear me singing a made up silly song in an attempt to make my kiddos laugh while they practice their specific articulation sound. Most of the time my students are huge fans of my impromptu silly songs (and I say most of the time because, well, let’s be honest, every song can’t be a hit, haha!). Are you working on the /TH/ sound? Try this bad boy out! I would like to take this opportunity to share with you one of my favorite original silly songs. It is called Five Thumb Monsters and a Dog and it is filled with tons of /TH/ sounds. Feel free to sing this as a song or read it aloud as a poem. Whatever way you choose to present it, I am sure your speech kiddos will dig it! In addition, I have posted a link below to a FREE Five Thumb Monsters and a Dog coloring sheet and MP3 for your downloading pleasure. then a thunderstorm came, and then there were four! then a thunderstorm came, and then there were three! then a thunderstorm came, and then there were two! then a thunderstorm came, and then there was one! then a dog came over, and gave him a bone! Oh, and don’t forget about your FREE DOWNLOAD! 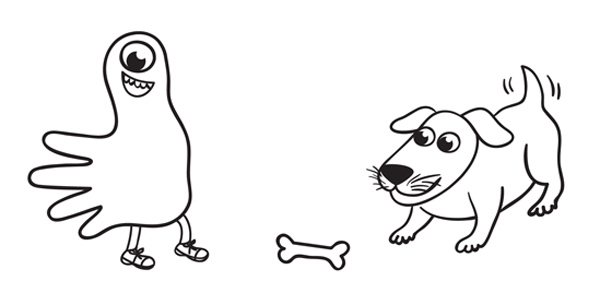 Click HERE to download the Five Thumb Monsters and a Dog coloring sheet and click HERE to download the Five Thumb Monsters and a Dog MP3. ← Wacky Zombies in Speech Therapy? Sign Me Up!